Campers will enjoy Bryn Mawr College’s state-of-the-art Applebee Field, staying in the air-conditioned college dorms, and the school’s yummy dining hall options. Victor Brady, 2018 Coach of the Year and his elite collegiate coaching staff will take campers through a creative and fun 4 days of hockey. Victor has completed his Level II USA Field Hockey Coaching Coursework and a 2x Coaches Forum Attendee. Every camper will receive a limited edition reversible jersey, ball, water bottle, and lanyard as well as other fun prizes. *Revo Field Hockey Camps are open to all ability levels and is a proud USA Field Hockey Partner Camp. Check In: 12pm – 1pm for both commuters and overnight campers. Tip for Extended Day Campers is to come at 12:30pm. First meal is Dinner. Check-in location will be at Pembroke East Dormitory. Check Out: Thursday, August 2nd. Parents are invited to attend final scrimmages that begin with warm-ups at 9:00am. Check-out and departure will follow at 12:00pm at Pembroke East Dormitory. The nearest airport is Philadelphia’s International Airport in Philadelphia, PA. You are responsible for getting yourself to and from campus, Revolution Field Hockey does not provide transportation. 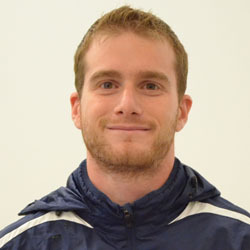 In addition to his college coaching experience, Brady is heavily involved in USA Field Hockey, club, and camp coaching. He served as a USA Futures Head Coach at two sites in 2016 and coached at the National Futures Championship in each of the past two years. Brady served as the coaching director for NOMADS Field Hockey Club in Northampton.